Set in a highly desirable area of Queen Creek, Arizona, Emblem at Gateway Quarter offers stunning single-family homes in a gorgeous community with every convenience right nearby. Walking trails, greenbelts, a basketball court, and a large park with a playground are all within the community, while golf courses, shops, restaurants, and schools are just minutes away. Close proximity to the 24 freeway and the 202 makes all of the Phoenix Metro area easily accessible, and when you have a further destination in mind, the Phoenix-Mesa Gateway Airport is less than seven miles away. 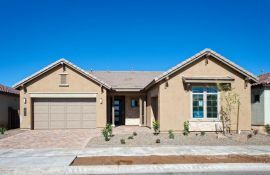 The new homes in Queen Creek at Emblem at Gateway Quarter range from ~2,300 to ~2,700 square feet, with 3 to 4 bedrooms, 2.5 to 3 baths, 3-car garages, and pool-worthy backyards. These unique, open-concept floorplans include upscale finishes, energy-efficient features, elegant baths, and gourmet kitchens—with built-in appliances, soaring cabinets, and soft-close drawers coming standard. Three unique architectural styles for these new homes, and a stunning palette of exterior colors create curb appeal and variety throughout the 85142 neighborhood.